Are you investing in quality, dividend paying stocks, either by buying individual stocks or investing in dividend oriented mutual funds or ETFs (exchange traded funds)? If you are not, then I ask you to take a look at this chart from the S&P. It’s the cumulative return of $1 invested in 1930 with two different investment schemes. 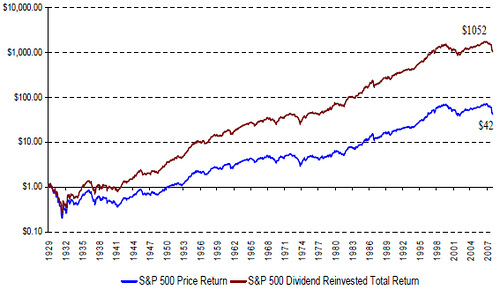 The red line is the return with dividend reinvestment and the blue one is price return only. As you can see, the difference between the two is huge, because of the compounding effect of dividend income. The whole deal about dividend reinvestment is that when dividend is distributed, you don’t take the cash distribution. Instead, you use the dividend to buy more shares of the stock. Over time, even without any new contribution, you will own more shares from the reinvestment, as long as the dividend keeps coming and you keep reinvesting it. How to Invest in Dividend Paying Stocks? Now you know dividend can make a difference in the long term, the next question is where to find best dividend-paying stocks to invest? You have a couple of options. First, if you want to buy individual stocks, then the recently published S&P 500 Dividend Aristocrats (PDF file) is a source to get you started. In Class of 2009, S&P selected 52 stocks from the index which have increased their dividends every year for at least 25 consecutive years. The full list of 52 dividend aristocrats is shown in the following , where I also added each stock’s dividend yield and current price (as of 01/13/09). To invest in individual stocks, you can either use cheap brokers such Zecco (10 zero commision trades per month) , which does offer free dividend reinvestment, or buy them through a DRIP program. If, on the other hand, you don’t want to own individual stocks because of the volatility and risk, then another options is investing in exchange-traded funds (ETFs) specializing in catching dividends. A while ago, I discussed how to use dividend paying ETFs to generate passive income. Check out that post to see which ETF has be best dividend yield. That post does need an update, though. The key aspect of looking at dividends yields is that the yield shouldn’t be high because of a beating that the price of the stock has taken. Right now is a weird but great time to have stocks that pay dividends, but a lot of their yields will be out of wack and will have to be adjusted. 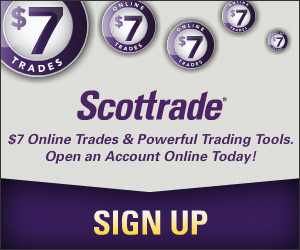 Even their history of never cutting dividends or any of that might change. This is one of those “black swan” type events, so I wouldn’t guarantee anything at this point. But for sure, dividends need to be in people’s portfolios. The chart says it all. Interesting. It can be difficult to find sector-specific information in the news today—but a recent book written by a client of mine is dedicated entirely to the Consumer Staples sector: http://consumerstaples.fisherinvestments.com/. It covers everything from a background on the sector and its various industries to investing techniques.